Accommodation: Shukubo Koya-san Eko-in Temple, booked through booking.com for ¥22,600 (about £125) a night for 2 people, including dinner and breakfast. Our next stop after Kyoto was Koyasan. Slightly off the more obvious tourist map, Koyasan had been recommended to us by my blogging buddy Adam who suggested an overnight stay in a Buddhist monastery. Koyasan (or Mount Koya) is a small temple town about 100km from Osaka. Founded about 1,200 years ago by a Buddhist priest called Kobo Daishi, Koyasan was named by UNESCO as part of the Sacred Sites and Pilgrimage Routes in the Kii Mountain Range in 2004. 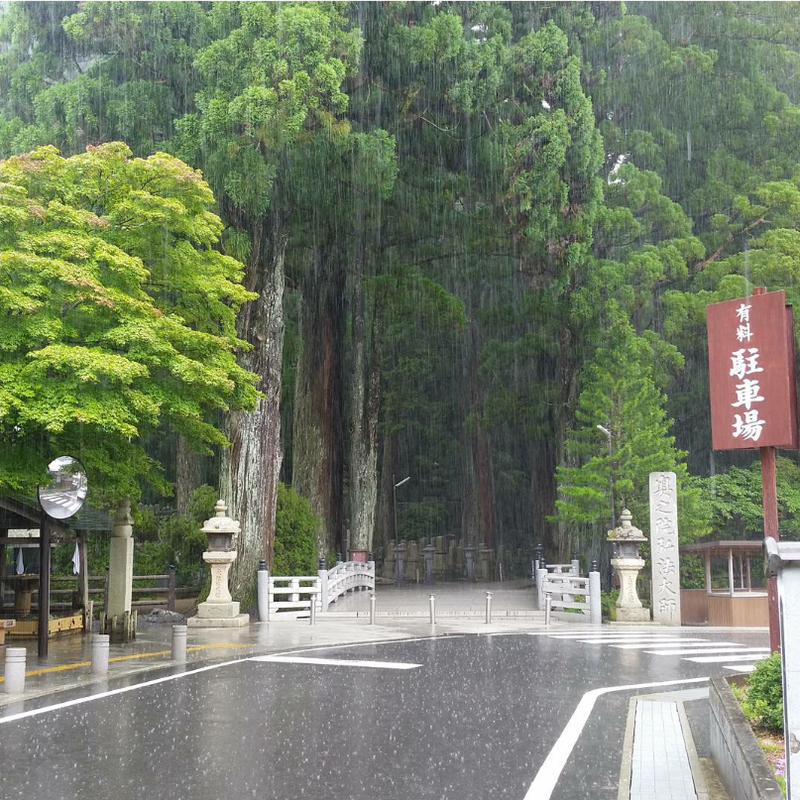 There are over 100 temples in Koyasan, with about 50 offering temple lodgings called shukubo. Adam recommended Eko-in Temple, which we booked to stay in for one night. One of the things that appealed to me about Koyasan was how secluded it is. However, this does mean it takes a while to get to. We left our apartment in Koyto and spent some time in the big Avanti shopping centre beside Kyoto Station picking up souvenirs, before heading to catch the Shinkansen to Osaka. From Osaka we jumped on a train to Shin-Imamiya Station. This first part of our trip was covered by the JR pass. When we got to Shin-Imamiya, we asked about tickets to Koyasan at the ticket desk and were offered the ‘Koyasan-World heritage ticket’. This cost ¥2,860 each return (about £16) and included the train from Shin-Imamiya Station to Gokurakubashi Station, the cable car from Gokurakubashi Station up to Koyasan and use of the buses in Koyasan. The whole journey from Kyoto took about 3 hours. We had a little time to kill after buying our tickets. Shin-Imamiya Station isn’t very big but we managed to find a little ramen place to sit down for lunch. There was also a takeaway shop where we bought gyoza and some rice and salmon parcels, wrapped and steamed in bamboo leaves. All delicious and reasonably priced. As our train got closer to Gokurakubashi Station, it got much quieter with only a few dozen people also heading to Koyasan – tourists/backpackers and a young monk (guessing this based on his shaved head and he looked like he knew where he was going). The station is the end of the line and stops right beside the bottom of the cable car line. The cable car takes about five minutes to work its way up the steep track to Koyasan. The mountain is so green with the lush scenery of the mountains to watch as you climb. When we got to the top of the cable car, there were people on hand ready to help tourists. They asked which temple/hotel we were booked into and directed us to a bus with a map, telling you what bus stop number you were to get off at. We were on the bus for about 15 minutes and got off at the stop we were told. Right across the road from the bus stop was the impressive entrance to Ekoin Temple. We were greeted by a young monk (I’d guess in his mid 20s) who asked us to swap our shoes for slippers, leave our bags and directed us to a small room, with another two couples and a man on his own. We all filled out our details and he asked if we wanted to order any drinks with our dinner (beer, sake or soft drinks), if we wanted to take part on the night time guided cemetery walk and gave us details of the meditation that day and the morning service and fire ritual the next morning. The shukubo is entirely staffed by monks and after the introduction, a monk took us to our room. This was at the other side of the shukubo, along beautiful wooden corridors and up a few flights of steep wooden stairs. Our room was a ‘traditional’ Japanese room and we loved it! Sliding paper screen doors, tatami-mat flooring, a little table to kneel beside and a balcony over-looking a beautiful garden. It was raining heavily which made it look even more beautiful and the sound was so relaxing and tranquil – especially after spending the last few days in busy cities. Each room also has a TV, a safe and wifi access. The bathroom facilities are shared and one of the toilets was right across from us. It was only a few days into our trip so we weren’t feeling brave enough to take on the shared baths quite yet so can’t comment on what these were like! After relaxing in our room for a while, watching the rain falling in the temple’s gardens, we headed to the meditation room to take part in the meditation session at 4.30pm. Eko-in shukubo is quite spread-out and a little like a maze but there is signs to point you in the right direction. We took off our shoes to go into the meditation room and each sat on little cushions provided. Japanese people were sitting at the front of the room, facing a Japanese-speaking monk and English speakers were sitting towards the back of the room with an English-speaking (Japanese) monk. The monk gave us some information and tips on meditating and told us how often the monks mediate, often out in the forest on their own. It sounds like a very chilled out life! He also said that meditating was quite difficult to get the hang of and took a lot of practice. The session lasted about an hour and I found it really difficult to zone out, spending a lot of time trying to get comfortable. We returned to our room and were served dinner on little raised trays on the floor. All of the temples serve only vegan meals and we each had two trays full of little bowls and plates of different dishes. There was also a pot of boiled rice and green tea. We had ordered beer and saki, which was left with the food. Both David and I don’t eat meat so weren’t too phased that it was vegan but we did find a lot of the dishes quite strange and struggled to eat a few. It’s considered rude in Japan not to eat what you are served so we tried our best to eat as much as we could. We called down to reception to say we had finished dinner and two monks arrived to clear away our dishes and set up our futon beds. A few minutes’ walk from our lodging was the entrance to Okunoin’s Cemetery, one of the most sacred places in Japan. It is the largest cemetery in Japan, with over 200,000 tombstones lining the almost two kilometer long approach to Kobo Daishi’s mausoleum. We paid ¥1,500 (about £8) each to take part in the night time cemetery walk, which was guided by one of the temple’s monks. It was dark when we started the walk and I expected it to be quite creepy but it was so tranquil and I found the cemetery to be a really magical place. We didn’t take any pictures on the walk as it was dark but I took this photo of the entrance of Okunoin’s Cemetery the next day, which is my favourite photo of our trip. You can see the rain hammering down and bouncing off the ground. We met at the entrance to Eko-in Temple and a group of about 10 of us walked the short distance to the cemetery. Our guide was excellent and we learnt so much about the religion and shrines within the cemetery. The path is dimly lit by lamps all the way along from the Ichinohashi Bridge at the entrance to Kobo Daishi’s mausoleum at the very end. He stopped at various interesting points along the walk and explained myths that they have, such as a well that you could look down and if you didn’t see your reflection at the bottom you would die in the next year. David and I (warily!) checked the next day and we’re going to survive the year – phew! We saw fire flies and flying squirrels on our walk, which the monk said was quite unusual in July so we were lucky! Before reaching Kobo Daishi’s mausoleum, you cross the Gobyonohashi Bridge. Before crossing the bridge you bow to Kobo Daishi, and beyond the bridge you are not allowed to take any photos, eat or drink. In front of the mausoleum is Torodo Hall (closed at night), which is a huge hall with bright orange lamps hanging above the surrounding walkway that are eternally lit. It looked fantastic in the dark cemetery. Behind the hall is Kobo Daishi’s mausoleum. Our guide explained that it is believed that Kobo Daishi is inside the mausoleum, eternally meditating. Monks that work at Okunoin Temple make him meals during the day and they are left for him. We saw monks transporting his breakfast the next day in their brilliant orange robes. When we were standing in front of Kobo Daishi’s mausoleum, we were invited to light incense sticks and the monk who was guiding us moved up to the front, facing the mausoleum and started to quietly chant sutra to himself. It was totally out of this world to be standing at the most sacred place in Japan, listening to a monk chanting sutra with the smell of incense in the air. We headed back over the Gobyonohashi Bridge, where our guide said goodbye and we were free to walk back to Eko-in Temple at our own pace. The group split up and David and I slowly wandered back to the cemetery entrance, enjoying the peacefulness, feeling like we were totally alone in this sacred cemetery. The guided walk was absolutely fantastic and I highly recommended going on this if it’s available. Back at our shukubo, I asked if it was possible to try shakyo, which had been listed as an activity available at the temple. Shakyo is where you use a brush and Chinese ink to hand-copy a well-known Buddhist sutra, Hannyashingyo. I was given a long sheet with vertical Chinese (I think) text written very lightly on the reverse and a calligraphy pen to copy the sutra, which I took back to our room. It took a while to do but was quite relaxing and I brought the finished sheet home as a souvenir to put up on the wall. We got ready for bed and got into our futons reasonably early as we had to be up for the 6.30am morning service the next day. The futon beds were comfy and we had a good night’s sleep. Bright and early the next day, we got dressed and went to the entrance to meet for the morning service. Picking up our shoes and clear umbrellas, we walked a short distance to the building that holds the morning service. There were about 20 of us kneeling at the front, observing the service and three monks taking part. The service lasted for about 30 minutes and was interesting to watch. The temple is beautiful and the monks performed the service with chanting and prayers, which is almost hypnotic to listen to. We were invited to go up to get incense and bow at the front of the temple. After the morning service, we moved to a smaller building and we squashed into a few rows for the fire ritual. The Goma Fire Ritual is performed daily in Shingon temples and is carried out to destroy negative energies, detrimental thoughts and desires and for the making of secular requests and blessings. This Fire Ritual involved a monk in the centre of the room starting a small fire which he built up and turned into a big roaring fire. Again there was chanting from the monks and the experience was quite hypnotic to watch. When we had first arrived in our rooms, there were Soegomagi laid out, which is a piece of wood to write a name and a wish on. The wood would be burnt in the holy fire from the Goma Fire Ritual (we forgot to take ours down before the cut off time). The monk had a pile of these Soegomagi, which he added to the fire. The fire ritual lasted about 30 minutes and once the fire was at its fullest, it slowly began to get smaller as it burnt out. We heard a few people staying at Eko-in saying that they weren’t going to bother getting up for the morning service or the Goma fire ritual. It was definitely worth getting up for and seemed a bit silly to travel all the way to Koyasan and leave out some of the experiences available. When we got back to our room at about 7.30am, our breakfast had been served and we each had one raised tray with various vegan dishes. This was our first Japanese breakfast and it was quite hard going so early in the morning! Eating traditional Japanese food for breakfast really made me realise how Western style breakfasts are really sweet and full of sugar. After breakfast we walked back through Okunoin’s Cemetery to Kobo Daishi’s mausoleum in the daylight. Although not as magical as the night before, we were able to have a proper look at some of the shrines and the Torodo Hall was open for us to look in and watch the monks carrying out their service inside. There is also a building beside Torodo Hall which houses all the bright orange lamps, which haven’t yet been bought, which was really eye catching to have a look around. Unfortunately no pictures allowed! It stopped raining for a while and we spent about an hour walking about the cemetery. On our way back to Eko-in Temple, we stopped at a souvenir shop and picked some things up, such as incense sticks. The smell of incense will always transport me back to our trip to Koyasan! There are other sites apart from the Cemetery in Koyasan but we decided that we were really happy with how much we had seen and decided to check out of our shukubo and start our trip back down Mount Koya towards our next stop – Osaka. Looking back on our trip to Japan, Koyasan was definitely one of my favourite places. A complete contrast to the big cities and bright lights of Tokyo and Osaka. I would definitely put it on my ‘must see’ list for anyone travelling to Japan. It’s slightly out of the way, but that adds to its charm. It was such a magical place and so peaceful to spend a night there in the beautiful temple lodging. sounds absolutely blissful. I’m wishing to go there in mid-october. Vegan buddhist (temple) food sounds amazing as well. It was the most peaceful place I’ve been. Especially the cemetery at night. You should definitely go if you can!